You may have heard the word firestopping thrown around the construction industry to describe any material used to prevent the spread of fire? But what is it really? A firestop is a material or combination of materials designed to re-establish the fire resistance rating of rated assemblies such as fire-rated walls, floors, and ceilings. These materials or systems are required to be fire tested and listed by an accredited, independent testing agency as proof of their performance in fire conditions. 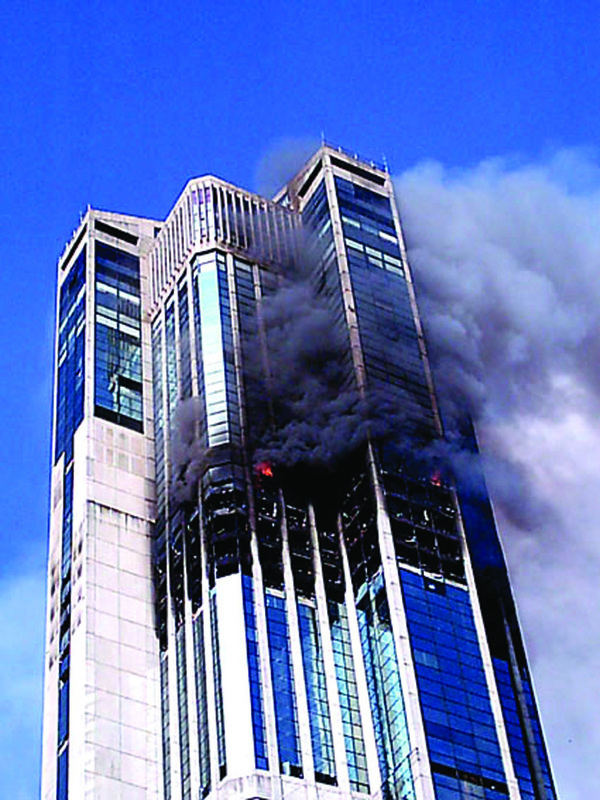 In this edition of International Fire Protection we will take a close look at a number of key considerations, including testing and fire rating. Part Two of this article will appear in the December edition of the magazine. Understanding what a firestop is, as well as where and why it is required, helps ensure that it is correctly installed. The use of firestopping is different than the use of fireproofing, fire-blocking, and firesafing, but unfortunately these terms often are confused and incorrectly used as interchangeable. Fireproofing applications deal primarily with the passive fire protection of structural steel elements of a building. These fireproofing applications also are tested by independent agencies in live fire tests and listed in resource directories. Fire-blocking is the process of installing materials to resist the free passage of flames in a building through concealed spaces. Firesafing generally refers to the fire-resistant insulation that sometimes is used as part of a firestop system. 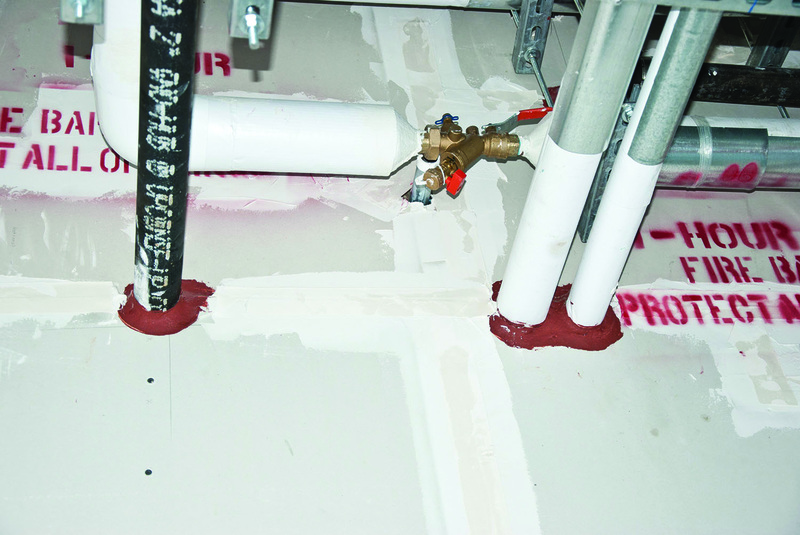 When a fire resistance-rated assembly is penetrated or a void is created due to the inclusion of a construction joint, a firestop system must be installed properly to reinstate the original fire-resistance rating of that assembly. Such situations occur on almost every commercial construction project. It is important to remember that firestopping is designed to perform as tested only once in its lifetime, and to do so it must be properly installed. Passive fire protection, which encompasses firestop as well as the other materials designed to prevent the spread of fire in a building, plays a key role in protecting life safety and property by preventing the passage of flames and smoke through rated assemblies. Using fire-resistant rated assemblies and firestop systems are a basic element of passive fire protection known as compartmentation. Creating fire-rated compartments within a building by constructing and maintaining the fire-resistance ratings of wall, floor, and ceiling assemblies prevents the rapid spread of fire throughout a structure. These fire-rated compartments are constructed of rated assemblies that are tested to resist the passage of hot gases, flames, and smoke for a minimum amount of time, and the firestop systems are installed and tested in these assemblies to prevent flame spread for the same duration as the assembly itself. To create a firestop system, all of the materials must be installed in a rated assembly and fire tested for integrity in the exact configuration in which they will be installed. The most widely recognised third-party test agency for fire testing is Underwriters Laboratories (UL), which tests, classifies, and lists firestop systems and materials as well as numerous other products used on a daily basis. The fire test standards used to determine the performance of the fire-stopped assemblies differ between penetration firestop applications (ASTM E814: Standard Test Method for Fire Tests of Penetration Firestop Systems and ANSI/UL 1479: Standard for Fire Tests of Through-Penetration Firestops) and construction joints (ASTM E1966: Standard Test Method for Fire-resistive Joint Systems and ANSI/UL 2079: Tests for Fire Resistance of Building Joint Systems). The ASTM and UL test standards dictate a temperature rise over time for the assemblies being tested. This time temperature curve, as it is referred to, is universally applied for all materials being tested to that particular standard no matter the agency doing the testing. The duration of the fire exposure testing depends on the rating of the assembly construction and the desired hourly rating of the system that is being tested. For example, if a two-hour fire resistance-rated concrete floor assembly is penetrated by a metallic pipe, the desired fire duration for the firestop test would be a minimum of two hours to match the rating of the floor. This provides firestop system hourly ratings that are equal to the hourly rating of the rated assembly that is being penetrated. Direct fire exposure and temperature measurements are not the only test criteria to which firestop systems are subjected in ASTM E814 and UL 1479 testing. The assemblies also must pass a water hose stream test. Immediately after the assemblies are removed from the test furnace, they are exposed to a 30-pounds-per-square-inch (psi) or 45-psi pressurised stream of water. The pressure level depends on the fire exposure duration. The hose stream is similar in appearance to that of a fire hose when the pass/fail test is performed. After exposure to the hose stream, if any water has passed through the assembly or any light is visible through the assembly, the tested assembly fails. The hose stream is an extremely difficult criterion to pass and demonstrates the overall assembly integrity after fire exposure. Only after successfully passing the fire exposure and hose stream portions of testing for penetrations can a system be listed by the testing agency as an approved firestopping method. Penetration fire tests provide data on the duration of time for which the assembly prevents the passage of flames, or F rating, as well as the duration of time during which the non-fire side of the assembly and penetrant reach 163°C over ambient temperature, or T rating. F and T ratings are mandatory measurements for ASTM E814 and UL 1479 testing, and every listed system will provide verification of the time in which the firestop system will prevent the passage of flames (F rating) as a measurement of hours and the temperature (T rating) in a hourly measurement as well. The significance of the T rating is that it provides a point at which combustible materials on the non-fire side of the rated assembly will catch fire due to temperature rise. Theoretically, this temperature rise possibly may allow fire to spread from one area to another by heat only, without any actual flames passing through a rated assembly. 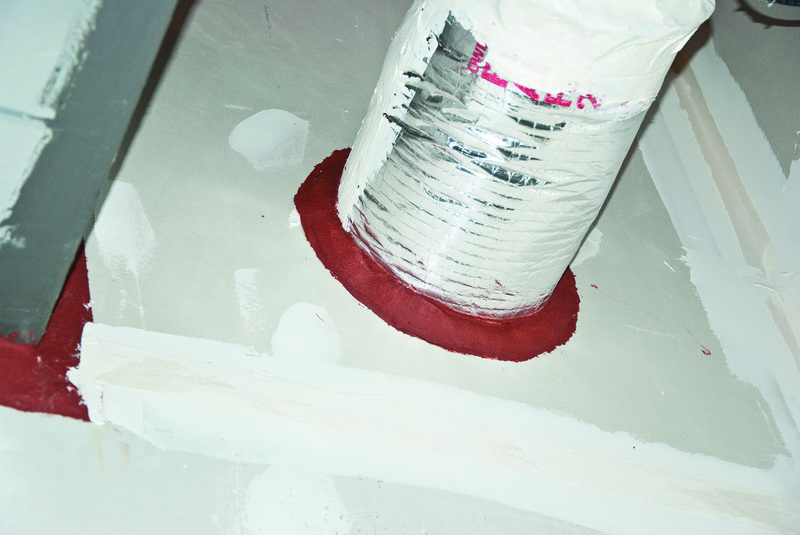 A firestop is a material or combination of materials designed to re-establish the fire resistance rating of rated assemblies such as fire-rated walls, floors, and ceilings. These materials or systems are required to be fire tested and listed by an accredited, independent testing agency as proof of their performance in fire conditions. Two optional ratings also are available through the UL 1479 test standard: a W rating, provided by a water-leakage test, and the L rating, provided by air-leakage testing. If a firestop system is W rated, it means the system has a water-resistive seal while still maintaining the fire-resistance rating of the assembly. The water-leakage test is conducted using a minimum pressure of 3 feet of water for duration of 72 hours. Successfully passing the water-leakage test using these test criteria provides firestop systems with a Class I W rating, allowing the system to be published with a W rating as well as an F and T rating. Air-leakage testing is a little more involved than the W rating and requires a pressurised testing chamber onto which the fire-stopped assemblies are mounted. The L rating measures the air movement through the firestop assembly at ambient air temperature (24°C) and at a temperature elevated to 163°C above ambient (204°C). The internal air pressure within the test chamber is maintained at a constant 7.6mm of water during the testing, and the amount of air that leaks through the fire-stopped application is measured. The air-leakage rate is represented in measurements of cubic feet per minute per cubic foot. Ratings less than 1 L are the highest or best performing, and increasing numbers denote decreased performance, which is undesirable if you are trying to stop smoke. Although the L and W ratings are optional when testing firestop systems, many building codes now require L ratings for smoke barrier assemblies of less than 5 cubic feet per minute per square foot, and some jurisdictions may require W rating for floor penetrations. In the next edition of International Fire Protection, we will look at the code requirements for firestopping and consider their implications for installers, discuss the required protection when fire-resistant assemblies are penetrated, and learn more about smoke barriers. We will also take a close look at firestop applications, intumescent materials, sealants and firestop devices.